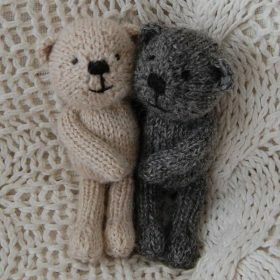 Merrythought is one of the most famous British bear makers. It’s origins were in a mohair mill set up in 1919 in Coalbrookdale (now Ironbridge) Shropshire. In the later 1920s it’s founders, W.G. Holmes and G.H. Laxton, found sales dropping in the face of new synthetic fibres. Soft toys offered a new way to use their mohair, and in 1930 they set up the Merrythought company. A.C. Janisch of J.K. Farnell and C.J. Rendel of Chad Valley joined the new company but it was deaf-mute designer Florence Atwood who was responsible for the first range of soft toys that appeared in 1931, including designs in golden mohair: the Magnet range in four sizes and the more expensive Merrythought range. At first the company’s soft toys were made almost entirely by hand, and not until 1955 was an automatic stuffing machine introduced. As well as bears, Merrythought made character animals, felt dolls, rocking horses and push-along toys. Its bears are noted for their very high quality. Merrythought bears from the 1930s are now eagerly sought after by collectors.